Georgia Democrat candidate Stacey Abrams for governor dodged a direct question on her gun control position, where she cosponsored a bill that would have led to gun confiscation. 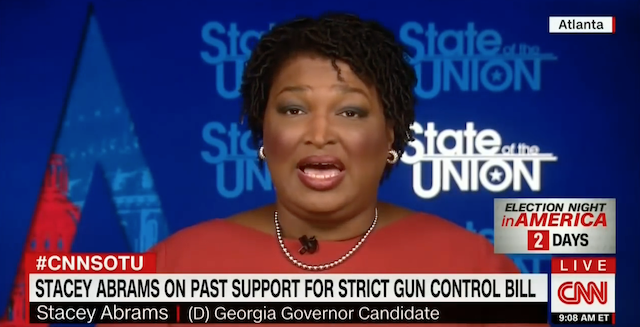 Progressives like Abrams want weapon confiscations they just don’t have the spine to outright say it. As demonstrated here, Abrams repeatedly went back to general talking point word mash on the need for “common-sense gun safety legislation”. What does that even mean after the thousands of laws already on the books at the federal and state level? Democrats for the most part have gotten what they want on gun control, but they continue to chip away on the Second Amendment blatantly violating its Do Not Touch clause “shall not be infringed”. Common sense gun safety means take them all away from the people. According to Abrams semiautomatic weapons should be classified and treated differently, and ArmaLite rifles (AR-15’s) have no place in the hands of citizens. You see it’s not just ArmaLite rifles dems want to get out of the hands of commoners, they want all weapons including semi-auto handguns. I am a gun owner running for governor, because I’m an elitist it’s okay for me to have any gun of my choice but you the commoner cannot be trusted. You should not have access to semiautomatic weapons, they should be highly restricted and only those of us elites should decide who can or cannot own a weapon. AR-15’s are scary black looking weapons that resemble those used by the military, you should not have access to them. All semi autos are bad you should only have access to muskets because that’s what was around when the Second Amendment, which I and my party despise, was written. Yes, I am for gun confiscation masqueraded under the call for “common-sense gun safety legislation”. GA voters wake up, do not elect a radical socialist to the governorship. Abrams will do to GA what dems have done to other red states, raising taxes, increasing cost of living, driving out business, violating actual rights (unlike the ones dems claim repubs are taking).